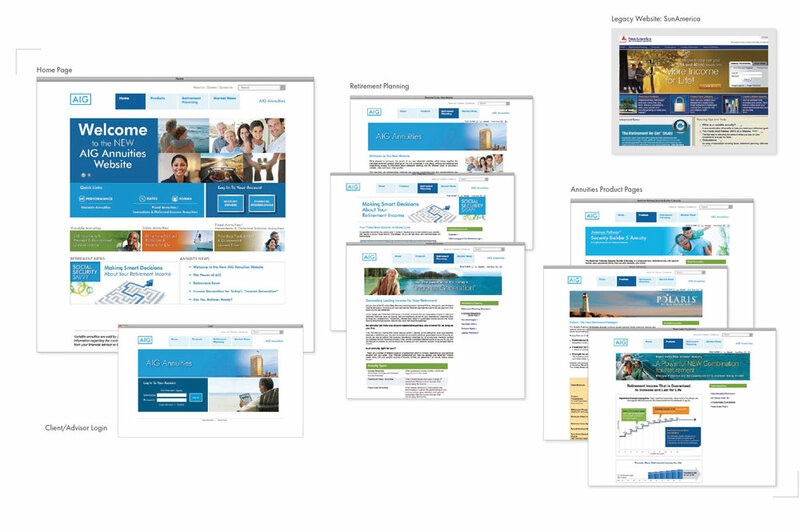 Rendering key lead involvement in the AIG rebrand of the SunAmerica website to the AIG Annuities website, I proactively initiated the developed technical specs for wire framing and for updated IT coding, eventually eliminating error between design and code. I provided astute conceptual direction, design, and overall refinement execution to the look and function of the new AIG Annuities website. It was a challenge to design in the pre-coded framework based on the old SunAmerica site. The overall dimensions were static and could not be changed. Initially it appeared very limiting, and it seemed it would work against our design strategy. I therefore mathematically restructured the pre-coded framework parameters to give flexibility to the design, without affecting the overall static dimensions of the website. This opened up possibilities of conceptual development and honed the present website design solution.